When you are not white, the question ‘Where you are from?’ is the curse you will never get rid of, not even when you do your best to wash yourself in the most radiating manifestations of Australianness. No matter how neutral your accent sounds, how much alcohol you manage to consume at any given social occasion or in the private space of your home, and no matter what political values you will associate yourself to publicly, you will always be faced with the question: where are you from? When I was fresh off the boat, I cheered at the question. Back in those early days, I had a clear sense of where I came from and where I ended up living as a result of pursuing a PhD at the University of Sydney. Back then, I was content with being encountered by others within the boundaries of what they thought it meant to be from Italy. Stereotypes about Italians might already have been annoying at times, but not yet perceived as a painful remainder of being from somewhere else. As time passed by, the usual jokes about being Italian began to make me feel like an absent presence, a migrant subject who is always expected to be gone, sooner or later. As I knew more of Australia, the same joke also began to make me feel like a present absence, a migrant subject who always existed in the past but was never acknowledged as foundational. Caught in this double negative form of existence, I started to wonder, who could I be when history forcefully came before me at every singular encounter? When you say ‘Hi, how are you?’ and the response infallibly is ‘Where are you from?’ the gate of the past is open right before you with one major effect: flooding you away into a collective imaginary where ideas about who you are have been passed on from generation to generation till it reaches you while doing your grocery shopping or buying a drink. Jokes never are just jokes. As with stereotypes, they are the condensed versions of the ways in which subjects in power have known others for their use and entertainment. To dig into that history then appeared to me as the best thing I could do to find a place for myself in a country that wanted me to exist on the margins. Instead, I had just started to scratch the surface. The story I figured myself one day to recount will have had more unexpected twists and forms of closure than I had originally predicted. I am the granddaughter of migrants. At the end of WWII, my maternal grandfather had illegally crossed 3 national borders by foot to work as a miner in Belgium. Stories about the years my grandfather had spent in Belgium as a single and married man, the jobs he had done and the few times he had almost died while working by the side of his brother are the fabric of the greenest years of my childhood. To my eyes, my grandfather was wrapped in a mystical light. He was my hero. When I found a photo of him dressed like a pilot posing next to a plane, I idealised him even more. Everything about him seemed to suggest grandiosity. Tellingly, more of his brothers migrated too and, once he married my grandmother, all his brothers and sisters in law followed suit. Whereas my grandparents eventually went back to Sicily with two daughters and a small fortune to start a business, everybody else had stayed overseas. They had gone to Belgium, France and Germany but also as far as Canada. I was thus born at the starting point of a transnational network of migration. My own family was part of an historical phenomenon, whose precise configuration went way beyond the imagination of a small child as well as what you are made to study at school. As a Sicilian who grew up in the stronghold of the North League, I should have been alerted to, or simply aware of, that Italians in general were not considered to be the same as Northern Europeans. Yet, I was not. I was a child and very much protected too. However, it is because of my childhood that the stories of Italians who migrated to Australia in the aftermath of WWII could resonate with me and make of fragmented memories a more coherent narrative. When I was a child, I was the migrant child. Like the Italian parents who migrated to Australia and never complained about the racism they suffered to secure a better future for their children, my parents too never said a word in front of us. They just worked. For the first time ever, I could see how the constellation of physical labour, resigned acceptance and children left at home on their own I grew up with was not the norm. Rather, it was so exceptional that an entire genre of academic and grey literature has existed about me, the child of migrant parents caught between two cultures. More importantly, for the first time ever, I realised that, in both the migratory trajectories of my life, I had been encountered as racially ambiguous, somewhere between white and coloured or, as Francesco Ricatti wrote, at the ‘bottom of the racialized hierarchy of whiteness (2018, 53).’ Signs for such realisation to occur had been everywhere. Rather quickly, I noticed how Australians did not count Italy as part of the West but included South Africa instead. They labelled Catholicism a backward religion, and similarly, deemed fascism an enduring characteristic of Italian politics. Yet, discovering that I was white only ambiguously hit on me with the same force as the realisation that women do not occupy a universal position. I did not know how to respond. Pride in our historical patrimony, achievements in the arts and fight against Fascism and Nazism progressively felt as much convincing as the contrived national myths of Australia. Second thoughts on how history was taught in Italy began to multiply, and so it did my aversion to the ‘Where are you from?’ question. Pride in the hard work of Italians and their resultant contribution to the development of Australia was a possible response too, one which Italian migrants themselves as a collective have deployed throughout the history of their presence in the country. However, as Ricatti has pointed out, besides reinforcing the idea that white privileges are something that migrants must earn, this response comes attached to the minimisation of racial discrimination as a stage which the country had gone through till the nation woke up to the beauty of its multicultural composition (65). Whenever I looked at the view of the city from my campus, I knew that there was more for me to find out. The history of land settlement and migration could not be unrelated to each other. What was then the role of Italians, who still are the biggest migrant group in the country? Why have the politics of belonging of Italian communities, who, in some regards, could be considered a subaltern group, coincided with nationally sanctioned foundational myths? Addressing these questions called for me to go against the grain of Australian historiography one step further. It also required for me to depart from my childhood. I did not just move to live in any country. Rather, I went to pursue an academic career in a settler colony. The narrative of Italians proving themselves worthy of inclusion by means of hard work is also tied to the myth that Australia was almost exclusively populated by Anglo-Celtic settlers[iv] till the end of WWII, when it was decided that it was time either to populate the country with less desirable Southern Europeans and Levantine migrants or to perish at the hand­­ of an imaginary Asian invasion (Stratton 1998, 85-88). Although the presence of non-Anglo Celtic settlers prior to the passing of the White Australia policy in 1901 was numerically less significant than in the decades following WWII, this does not alter the fact that most Australian communities were as much culturally as racially mixed. [v] Neglecting that non-white migrants had played a significant role prior to WWII erases the history of continuous presence of several migrant groups in the country. This erasure, in turn, reinforces a further division between settlers and migrants;[vi] whereas the former ‘settled’ the country, the latter contributed to its economic development. This division assigns to the two groups as much two different functions as ontological positions. Only those who have tamed and put the land to use can claim the country as a possession, inclusion to which can be consequently administered as a gift granted upon fulfilment of certain conditions. Besides being misused, this narrative is theoretically ill-founded. Firstly, as Ricatti has pointed, settler colonialism cannot be reduced to a precise historical occurence such as the frontier (68). As Patrick Wolfe has taught us, settler colonialism is not an event but a structure of social relations and related material practices which iteratively dispossess Indigenous people of their sovereignty and land (1998, 2). Secondly, as Tracey Banivanua-mar has demonstrated, the violence the frontier is usually identified with did not subdue with the advent of settlement, rather, it became normalised by means of laws and moral codes which continued to overdetermine the existence of Indigenous people at the level of everyday life (2007, 11-13). Taken together, these insights made me see that, if I could demonstrate that the stage of economic development of the country was permeated with the same violence as the frontier, I could then prove the collusion of Italians with the settler colonial project of Indigenous dispossession. Following this insight, I started looking at the sugar towns of North Queensland, which is where most Italians settled to relaunch the agricultural development of the colony starting from the late 1890s. 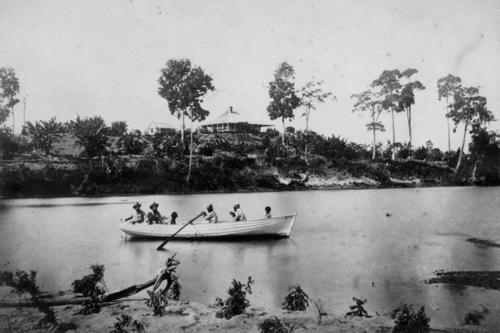 As William A. Douglass has recounted, debates about establishing migration schemes for Italians had in fact coincided with the shift from a plantation to a central-mill system in the sugar industry of Queensland. Practically, this shift led to the division of former plantation properties into small and medium sized farms, which were to be cultivated without relying upon indentured South Sea Islanders (1995, 35). On these conditions, plantation owners agreed to sell their land to Italian migrants after they worked for a few years on their properties. The Italian Government had similar aspirations. After the disastrous military efforts to colonise Africa, the Italian Government began to look at emigration as a form of imperialism through which to expand overseas trade as well as raise the international prestige of the country (Dewhirst 2016, 28-30). Since the Italian Government had envisioned for its colonists to be farmers, it refused to withdraw from the 1883 Treaty of Commerce and Navigation, which afforded Italian migrants in Australia, whether naturalised or not, with the same residency and property rights as Anglo-Celtic settlers (Dewhirst 2014, 88). With this historical context in mind, I found myself before the unusual case of the South Sea Islanders Bobby Tanna, Willie Tanna, and Renne Cassady attacking the Italian farmer Dario Tovo while the latter was on his way back home. As the alleged attack occurred in the summer of 1927, when anti-Italian resentment was at its highest point due to labour strife, this case furthermore caught my attention for an apparent lack of rationale. Sensationalist headlines such as ‘Assaulted and Robbed. Kanakas Attack Farmer’ (Telegraph 1927) and ‘Brutal Assault. Three Savage Kanakas Farmer Attacked Near Ingham’ (Cairns Post 1927) aside, the articles of those days reported on the assault as if it had been completely random or, at best, motivated by the intention of robbing the Italian farmer of his clothes and money. Little information is also provided about the victim’s reaction, who, apparently, had passively accepted the attackers’ instructions until he was asked for money. As I learnt from Banivanua-mar, the description of the attack as random is consistent with the characterisation of South Sea Islanders as ‘black, savage, tribal, violent, and physical (2007, 3).’ As she has demonstrated, this characterisation constituted the rendition of a discursive frame which justified the colonial violence exerted upon indentured labourers as a necessary means to enforce law and order. Consequently, I dug the archive looking for a rationale, which would have also shed light on the relations existing between the alleged attackers and the victim. In so doing, I found that among the three assailants, only Bobby Tanna had a criminal record. He had in fact been arrested for the first time in 1922 for creating disturbance in Ingham, then in 1925 for stealing and unlawfully killing a horse once more in Ingham. In 1926, he was arrested for stealing an accordion in Ingham, again. In 1928, he was arrested in Proserpine and in 1936 was arrested for the last time for stealing in Townsville. Bobby Tanna’s biological father had likewise a long history of presence in the colony. According to his indigence allowance application,[x] Tommy Tanna was a native of Tanna Island who came to Queensland with a 3 years contract. After having lived in several places and engaged in a variety of jobs, he settled and worked in Ingham for almost 20 years. In many regards, Bobby Tanna’s family was a respectable one with a long history of presence in town, albeit their rights to residency, property and work had been constrained by continuous state legislated interventions as well as locally decreed by-laws. In contrast to Bobby Tanna and his family, Dario Tovo could be classified as a ‘new arrival.’ As his application for naturalisation states, Dario Tovo was born in 1907 in Casalino, province of Mombello, Piedmont Region. He had arrived in the port of Brisbane in 1925 on the Regina D’Italia ship and applied for naturalisation as soon as he could in 1930. According to the register of firms in Ingham,[xi] Dario joined his two brothers Carlo and Delfurio on their farm in Helen Hills, which they had acquired in 1925. The archive does not hold any more records on the history of the Tovo brothers’ presence in Queensland. Yet, as it is was common at that time, it is very likely that they had lived in Ingham for a few years before calling upon their youngest brother to join them. Considering their respective histories of presence in Ingham, it seems unlikely that the assault was as random as the news of day had reported. Rather, it was more likely that the assault had occurred over a wage dispute or any other work-related issue. Unfortunately, since the archive does not disclose more than what I recount here, we will never know what was the true motive of the assault. However, the discursive rendition of the attack as random perfectly exemplifies how violence did not stop with the end of the frontier. Rather, it has persisted over several stages of settlement as well as structured enduring social relations which privilege not only settlers but also some migrants over others. Strangely, the case of the assault of Dario Tovo gave me the closure I needed right before leaving. Moving backwards in history further and further, I could realise who I was vis-à-vis a country that had made me feel as caught in a double negative form of existence. Whereas I was called upon to identify myself as the migrant who made it, I learnt that I needed to look at the country’s history of settler colonial violence as the set of conditions that predated my arrival. In so doing, I realised that I too was Dario Tovo, the seeming victim of a violent attack who was instead the benefactor of social relations stratified by centuries of imperial power. To belong, I had to look at this history relationally. How has Italian migration impacted upon those who never ceded their sovereignty or those who were forcefully brought to Australia for their labour to be exploited? And now that I am gone, at least for the time being, I am left wondering, who am I vis-à-vis new migrants in Italy? [i] This differentiation was drawn by William Z. Ripley but popularised by Madison Grant, Lothrop Stoddard, Clinton Stoddard Burr, William McDougall, Henry Pratt Fairchild and Henry Fairfield Osborn, whose theories informed the characterisation of Southern European migrating to US­ as inferior in 1924 Immigration Act. See Guglielmo 2003, 60-63. [ii] The points test was adopted in 1982 to differentiate among prospective migrants according to their level of professional and/or entrepreneurial skills. This was the first step taken to shift the the migration program from family reunion to long-term skilled migration. Aiming to fill skill shortage, this shift has more than augmented the skill base of Australia. It has also legitimised the practice of valuing non-white migrants on economic terms. For a critique to this shift and related apprehension of multiculturalism as a form of conditional love, see Indelicato 2018, 40-41 and 68-71. [iii] For a critique to the use of suffering as a strategy to facilitate non-white migrants’ inclusion in Australia, see Indelicato 2018, 155-179. [iv] I borrow the category of Anglo-Celtic from Jon Stratton, who adopted it to emphasise the later inclusion of Irish into the Australian definition of whiteness in contrast to the original identification of it only with Britishness. Ghassan Hage uses the same category instead to highlight how the Norther European ideal will also represent the limit of what can count as Australian. See Stratton 2004, 222–238; and Hage 1998, 58-59. [vi] For a critical analysis of the major structural differences between settlers and migrants see Veracini 2010, 3-4. [vii] Queensland Marriage Certificate, 1927/C1156, Rober Tanna and Vera Bessie Puller. [viii] Queensland State Archives, Item ID 336449, Marriages, 1912/1116 – Tommy Quetta and Minnie, letter dated 6 June 1912, 133-135. [ix] Queensland State Archives, Item ID 336449, Marriages, 1912/1116 – Tommy Quetta and Minnie, Letter dated 27 May 1912, 133-135. [x] Queensland State Archives, Item ID 18076, Tom Nehow – Indigence Case File 1638. [xi] Queensland State Archives, Series ID 8586, Register of Firms. ‘Assaulted and Robbed, Kanakas Attack Farmer,’ Telegraph, Queensland, Brisbane 1927, 30 July, 19. Banivanua-Mar T., Violence and Colonial Dialogue: the Australian-Pacific Indentured Labor Trade, University of Hawai’s Press, Honolulu 2007. Dewhirst C., The Anglo-Italian Treaty: Australia’s imperial obligations to Italian migrants, 1883-1940 in Cresciani G., Mascitelli B. (ed), Italy and Australia: An Asymmetrical Relationship, Connor Court Publishing, Ballarat 2014, 81-113. Dewhirst C., Colonising Italians: Italian Imperialism and Agricultural “Colonies” in ‘Australia, 1881–1914’, «The Journal of Imperial and Commonwealth History» 44, no. 1, 2016, 23-47. Douglass W. A., From Italy to Ingham. Italians in North Queensland, University of Queensland Press, Brisbane 1995. Ganter R., Mixed Relations: Asian-Aboriginal Contact in North Australia, University of Western Australia Press, Crawley 2006. Guglielmo T. A., White on Arrival. Italians, Race, Color and Power in Chicago, 1890-1945, Oxford University Press, Oxford 2003. Hage G., White Nation: Fantasy of White Supremacy in a Multicultural Society, Pluto Press, Sydney 1998. Indelicato M. E, Australia’s New Migrants: International Students’ History of Affective Encounters with the Border, Routledge, London 2018. Ricatti F., Italians in Australia. History, Memory, Identity, Palgrave Pivot 2018. Stratton J., Race Daze: Australia in Identity Crisis, Pluto Press, Sydney1998. Stratton J., Borderline Anxieties: What Whitening the Irish Has to Do with Keeping Out Asylum Seekers, in Moreton-Robinson A. (ed. ), Whitening Race: Essay in Social and Cultural Criticism, Aboriginal Studies Press, Canberra 2004, 222–238. Queensland Marriage Certificate, 1927/C1156, Rober Tanna and Vera Bessie Puller. Queensland State Archives, Item ID 336449, Marriages, 1912/1116 – Tommy Quetta and Minnie, letter dated 6 June 1912, 133-135. Queensland State Archives, Item ID 18076, Tom Nehow – Indigence Case File 1638. Veracini L., Settler Colonialism. A Theoretical Overview Palgrave Macmillan, Cham 2010. Wolfe P., Settler Colonialism and the Transformation of Anthropology: The Politics and Poetics of an Ethnographic Event, Continuum International Publishing Group, London 1998.